I am a long time Arkansas Therapist and I am very concerned with our profession and the direction in which it is headed. Patients deserve the very best of care from the very best of caregivers. Patient care especially ventilator care and treatment administration very strong in these areas. Building strong relationships with fellow employees, patients, and patient families are very important to me.Being a strong leader and helping and teaching the younger therapists are very important to me as well. NICU Therapist Jun 2007－Jun 2010 Baptist Health － Little Rock, Arkansas I had experience in the following:Ventilator care of the neonate.Conventional, High Frequency, Nitric.Attended all high risk deliveries in L/D.Transport of the neonate both air and ground.Treatments, blood gases, chest physical therapy, oxygen delivery, resuscitation, equipment cleaning and maintenance and all relevant paperwork. Registered Respiratory Therapist Jul 2002－Jul 2007 Intellistaff Staffing Agency － Little Rock , Ark Travelled the state of Arkansas providing all modes of Respiratory Care. Ventilator care, treatments, oxygen delivery, codes, blood gases. were just some of the therapies I delivered. Registered Respiratory Therapist Jun 1989－Jun 1993 Arkansas Children's Hospital － Little Rock, Ark All modes of pediatric and neonatal patient care. Including ventilators and treatments, blood gases, emergency care. 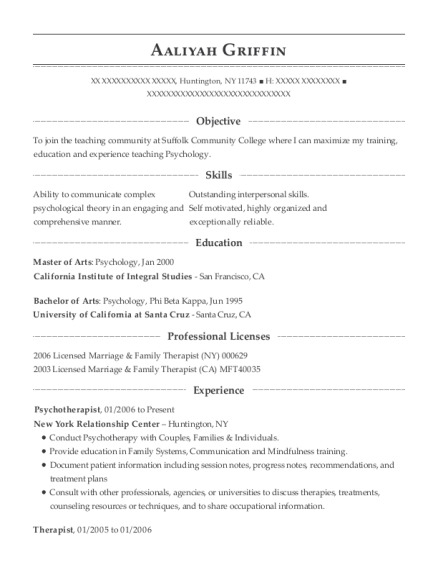 My first job as a Registered Therapist! Respiratory Therapist/Combat Engineer Nov 1990－Aug 1991 United States Army － Washington, DC Called up to proudly serve in our nation's service in Desert Storm. Started out as an Engineer but was used later as a Therapist in a Field Evacuation Hospital unit. Associate of Science : Science/Biology Arkansas State University － Jonesboro, Ar. Attended Arkansas State University from 1985 to 1987 to gain my prerequisites to attend Respiratory Therapy school.Attended Crestwood Career College in Tempe,Arizona from 1987 to 1989 and obtained an Associate Degree in Science/Respiratory Therapy in 1989.Currently enrolled at ASU working towards a bachelors degree in nursing science. 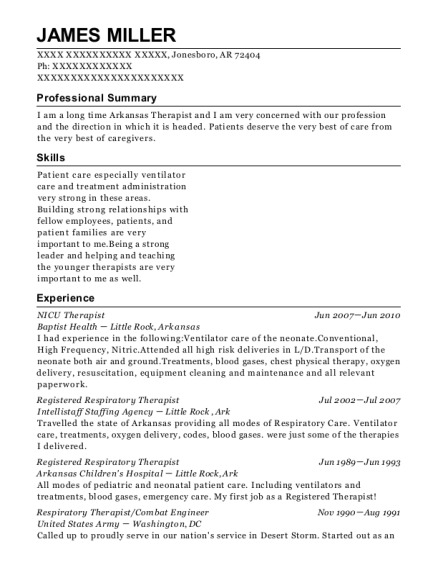 This is a resume for a NICU Therapist in Jonesboro, Arkansas with experience working for such companies as Baptist Health and Intellistaff Staffing Agency. 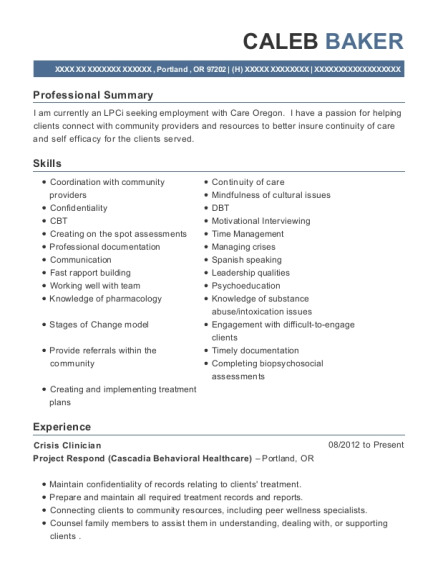 The grade for this resume is 0 and is one of hundreds of NICU Therapist resumes available on our site for free. 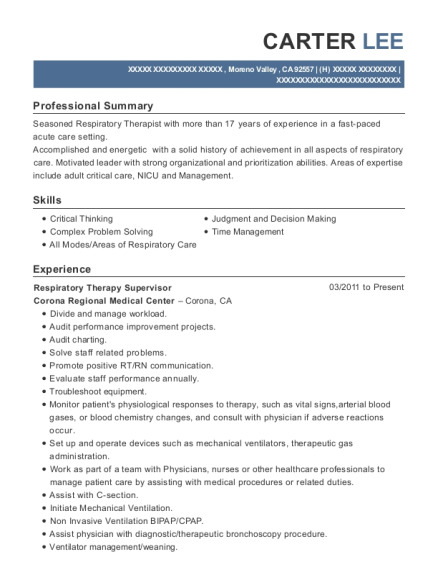 Use these resumes as templates to get help creating the best NICU Therapist resume.